The Falcons have an 'always recruiting' policy which applies to both the adult and youth team. 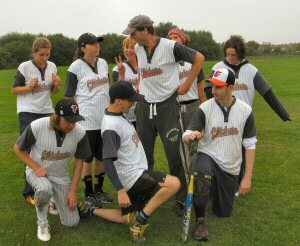 Anyone of any ability who wants to join in and play softball with us is very welcome! If you want to join any of our teams, just get in touch to check where & when we are next meeting to practise, or check the calendar. There is no membership fee at all. 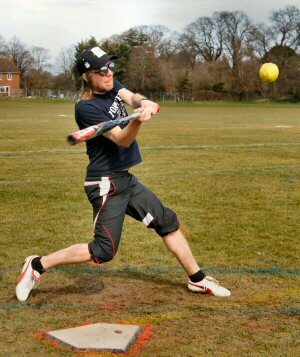 We are a non-profit organisation so players simply pay to play - this goes towards field hire, equipment and insurance. There are different fees for training and matches. Adults training is £3 for outdoors, per session. Teeball and juniors training is paid for at the start of each programme, and usually works out at around £4 per session. Adults matches are £4 per match for outdoors (outdoor matches are a lot longer). If anyone gets subbed in or out, their fee is adjusted accordingly so you only pay for what you play. 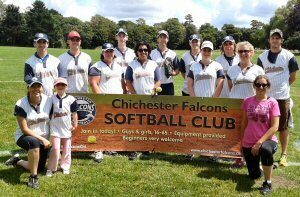 The Falcons also regularly enter tournaments in the UK and abroad; fees for these vary greatly but generally UK tournaments work out at £10-£15 per player per day. Whilst we have all the playing equipment you need (gloves, bats, balls, bases etc), it is always best to have your own glove. However if you're just starting out in the game, you are very welcome to use a glove from our kit bag. For clothing, we recommend loose, comfortable clothes. Trainers are fine but for outdoor play it's best to wear shoes with cleats or studs (rubber or plastic - no metal please). And don't forget your cap! You can buy Falcons shirts, hoodies and caps in our online store. We always have at least one qualified coach at each session. Everybody warms up and stretches together, then we typically pair off for a game of catch, before splitting into groups to work on specific skills. Every session always end with a game. Our practise sessions are designed to be a good workout whilst keeping things fun and informal. Everybody works hard, and players are expected to be attentative, proactive and keen to learn & improve. Matches are a fun and frantic affair! As a club we aim to play hard, have fun and make as much noise as possible. Matches are surprisingly informal and are a great way to learn the game in a hurry. What else do we do other than play softball? We aim to hook everybody up for a social night at least once a month. We go bowling, have movie nights, go hiking, get a meal, you name it. Socials are a good way to get to know the team!